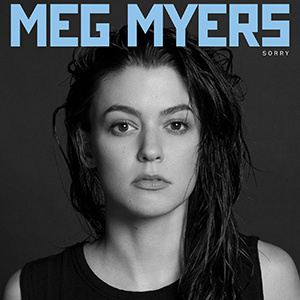 Meg Myers has no reason to apologize for the release of Sorry, except that the haunting singer/songwriter’s first full-length album should have dropped years ago. Having already scored two radio hits with singles “Desire” and “Sorry,” the Tennessee native’s first album was a long time coming. Sorry is 10 tracks of raw and eerie storytelling, falling somewhere between alternative rock and Goth pop. Dark and passionate almost to the point of being disturbing, Myer’s vocals range from soft, broken, and gentle to frenzied growling and screaming in the span of a four-minute song — think Alanis Morissette meets Marilyn Manson. Myers brings in the full-fledged darkness with the lyrically feverish “Desire” and “I Really Want You to Hate Me,” with lyrics such as, “I gotta hunt you / I gotta bring you to my hell,” and, “There’s no love for the wicked.” Pairing violins and harpsichords alongside rock electric guitars, Myers creates a slew of catchy could-be radio hits contained in an album filled with ominous undertones.